HomeIndustry NewsReality Check: How does the government help first-time buyers? Recent research suggests that it can take a young person about 18 years to put together the downpayment on their first property – although the Bank of Mum and Dad can hurry the process along. But what help is available from the government for first-time buyers in the UK? Since December 2015, first-time buyers in the UK have been able to save in a Help-to-Buy Individual Savings Account (Isa). Under the scheme, savers receive a 25% bonus from the government when they withdraw the money they have saved to buy their first property. The maximum purchase price is £250,000, or £450,000 in London. The maximum government bonus someone can receive is £3,000, if they have saved £12,000. Savers can deposit up to £200 a month, although they can kick-start saving with a lump sum of £1,200. The most recent figures show that the Isa scheme has supported nearly 170,000 property completions between December 2015 and June 2018. The average value of a property purchased using the scheme in the period to June 2018 stood at £172,787, compared with the average first-time-buyer price of £193,006. But, Iona Bain, founder of the Young Money blog, says Help-to-Buy Isas are on the way out, due to the the fact they won’t be available to new savers after November 2019, and to the introduction of the Lifetime Isa. She said: “Depending on your point of view, Help-to-Buy Isas were either a boon or an impediment to young people. For some, it was a groundbreaking product that provided a boost to first-time buyers, and the first sign of a government taking young people’s financial goals seriously. The government lends up to 20% of the cost of a newly built property – or 40% within Greater London – so buyers need only a 5% deposit and a 75% mortgage to buy it. Those purchasing a new-build home aren’t charged interest for the first five years, either. According to the latest figures from the Ministry of Housing, Communities & Local Government (MHCLG), the government has provided £9.9bn of Help- to-Buy equity loans since April 2013. The official data shows that 183,947 properties have been bought with these loans in England. First-time buyers have accounted for 81% of total purchases. But some critics of the scheme have said that it is used by existing homeowners to discount purchases. They have accounted for over 35,000 purchases under the scheme so far. The average Help-to-Buy purchase by a previous or existing homeowner costs £58,000 more than one purchased by a first-timer in England. In the year to 30 June 2018 the number of first-time buyers purchasing properties under the scheme increased by 16% compared with the year before. Paula Higgins, chief executive of the Homeowners’ Alliance, said: “Although Help-to-Buy has enabled a whole generation of buyers who did not believe they had a chance of getting on the property ladder to aspire to home ownership, it has also benefited those who would have been in a position to buy anyway. Research by investment bank Morgan Stanley in 2017 also suggested that increasing demand for new-builds following the scheme’s introduction has pushed up prices. It found that the price of new-builds had outstripped second-hand properties by 15% since 2013. That led to critics saying that house builders had benefited significantly from the scheme. Similar ones exist in Wales, Scotland and Northern Ireland. The shared-ownership scheme is a cross between buying and renting. It lets borrowers purchase between 25% and 75% of a property, and pay rent for the remaining bit. The homes on offer are usually new-builds or those being resold by housing associations in England. Over time, occupiers can “staircase” – buy a bigger share of the property when they can afford to – until they own 100% of it. In England, the eligibility criteria are that the purchaser is a first-time buyer, or someone who used to own but can’t afford to now. Annual household incomes need to be below £80,000, or £90,000 in London. Wales, Scotland and Northern Ireland operate similar schemes. On average, people buying shared-ownership properties are 35 years old, according to the MHCLG. The Council of Mortgage Lenders has estimated that 200,000 UK households live in shared-ownership properties. In 2017, the chancellor announced that stamp duty – the tax applied when people buy properties above a certain value – would be scrapped for most first-time buyers. That was extended to include shared-ownership schemes in 2018. HM Revenue and Customs says that more than 180,500 buyers have used the tax relief so far. Independent property expert Henry Pryor told BBC Reality Check there were several criticisms of shared ownership, including the fact that until you own 100% of the property, you’re treated as a tenant in law, which could mean you lose your property if you don’t keep up the rental payments. People also normally have to pay a maintenance or service charge on the whole value of the property – and buying a larger share can be expensive. The government announced the starter-homes initiative in 2014. It said it would build homes to be sold at a discount of 20% to first-time buyers between the ages of 23 and 40. 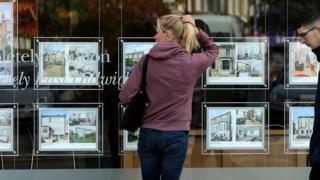 Eligible buyers would need a combined household income of less than £90,000 in London, or £80,000 in the rest of England. The starter homes will generally be built on brownfield sites – land previously used for commercial or industrial purposes – although construction hasn’t begun yet. Housing minister Kit Malthouse said: “We are determined to restore the dream of home-ownership for a new generation, and last year saw the highest number of first-time buyers for over a decade. “Starter homes are part of this mission to build more, better, faster but it’s important we get them right.